Thanks!!!!! it works on mac book pro with os 10.7.4 and an external HDD formatted ext.3 by a dreambox DM800HD. Thanks for the tip! That worked for me (after I remembered to mount the disk with sudo) with a WD Passport USB disk and OSX 10.8.2. Appreciated…. — Thanx for this information. Turned out to be helpful in resolving Mac OSX/Maverics (10.9…) NTFS mount issue. Had mucked around many hours diagnosing/researching largely to no avail. 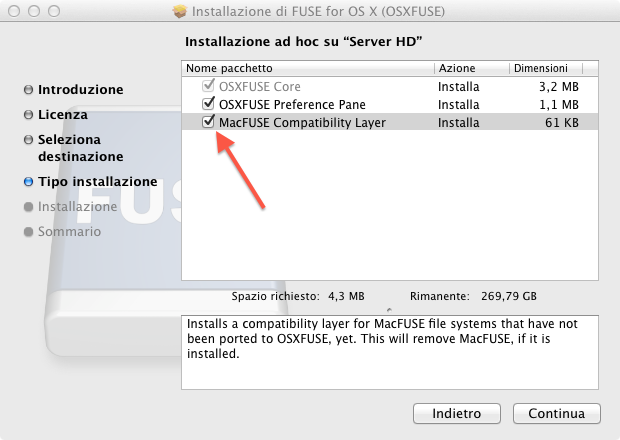 Re-installing OSXFUSE with the MacFUSE Compatibility Layer turned on finally did the trick. — Once successfully mounted, the error message: “Did not receive a signal within 15.000000 seconds. Exiting…” continues (as noted before with Mountain Lion/10.8…), which apparently can safely be ignored. Presuming the latter result of compatibility layer issues not yet resolved. — NTFS mount issued resolved as noted in my 2014.06.25 note, found to be very stable configuration and judged reliable in essentially daily use with primary NTFS working drive for personal information management (PIM) — all personal working files/data to keep as “Personal Portable Private Cloud” drive for working with various computers (desktops, laptops, …) & operating systems (including OSX, Linux, MS). — Although secondary error message continues, re: “Did not receive a signal within 15.000000 seconds. …” on every new mount of the NTFS drive continues; ignoring the warning so far has resulting in no noticeable negative consequences. — Operability continues after recent upgrade/update to OSX 10.10 Yosemite. Valeu cara, deu certo no meu!!! I saw it also some times. As far as I understood it could happen with slow bus/external USB drives. In my experience it is harmless.